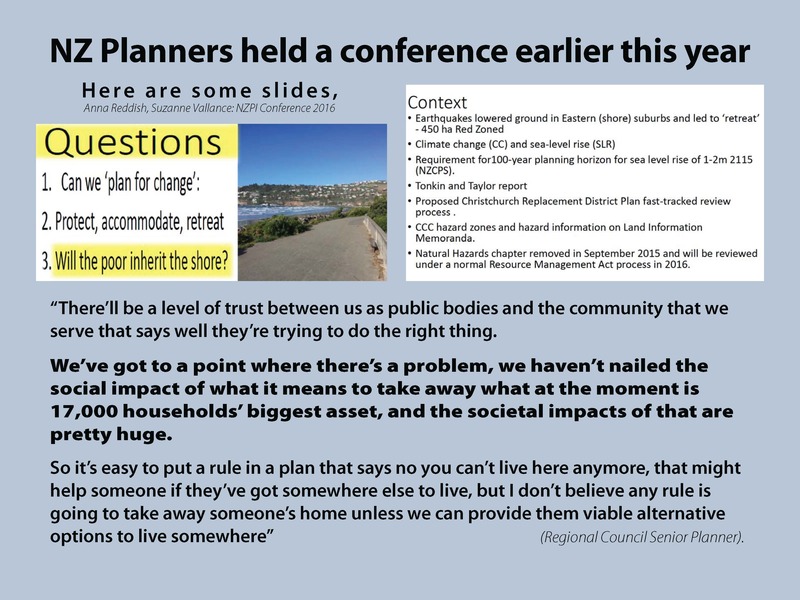 Part A: Council has been applying Existing Use Right inappropriately, without following the process set out in the Resource Management Act, ignoring its own recommended procedure, ignoring MBIE guidelines on floor levels with EURs, and ignoring legal advice about development in high hazard areas. Council has been working against ratepayers in the interests of insurance companies and very few houses have been rebuilt to the correct height or repaired to the correct standard. However, Council’s role is irrelevant in terms of the relationship between claimants and insurer and claimants and EQC. Homeowners should get expert advice and insist on their entitlement under their insurance policy and/or the EQC Act. CERA promised that houses would be rebuilt to the correct, safe heights. 900 properties in Christchurch are at high risk of flooding. 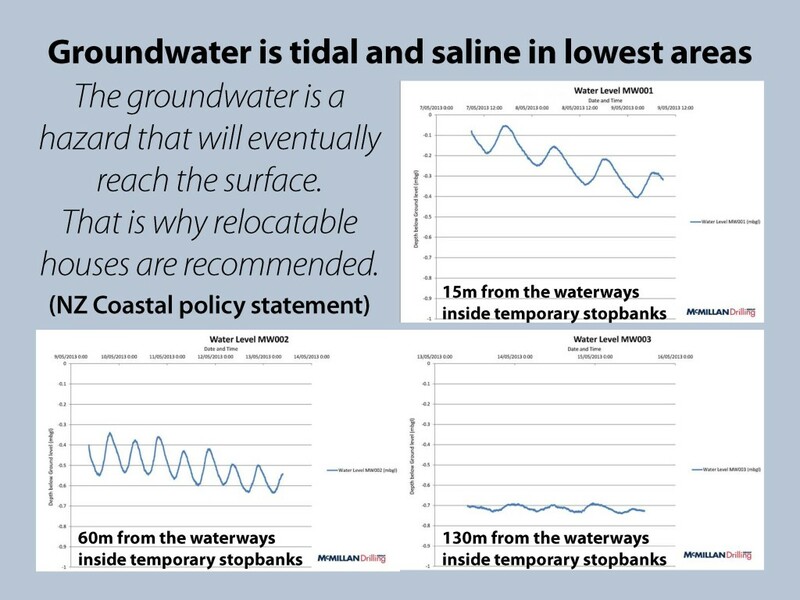 The tidally influenced area extends much further than Council has admitted and rising groundwater and constant erosion poses a huge problem that has not been addressed. Séamus welcomed everyone, introduced the speakers, and began with the background to the meeting. A meeting had been held with the Mayor on Council premises on 6 April 2016 to discuss various issues, including existing use rights, stop banks, and the old and vulnerable in the community. On that occasion, the Mayor had argued that Council had no legal basis for blocking the use of existing use rights. Another meeting with a Council team followed on 26 April, following the discovery of the discrepancy in flood modelling for the area north of Bridge Street in South Brighton. The explanation given at that time was that the 50 cm difference in floor levels between the two areas was a “revised assumption”, rather than a colossal mistake. Council originally estimated that only seven or eight houses were affected, and has subsequently revised the number downwards to five. As an outcome from the meeting, Council undertook to contact the people involved, to revise the incorrect PIMs, and to notify the insurance companies. Existing use rights is only defined under the Resource Management Act (RMA). An application procedure is set out that leads to the issue of an existing use rights certificate. Certain criteria must also be met for a property to qualify for existing use rights. Over the last five years, council has unilaterally declared EUR to apply to properties, with no reference to the RMA, and with no evidence requested or provided. 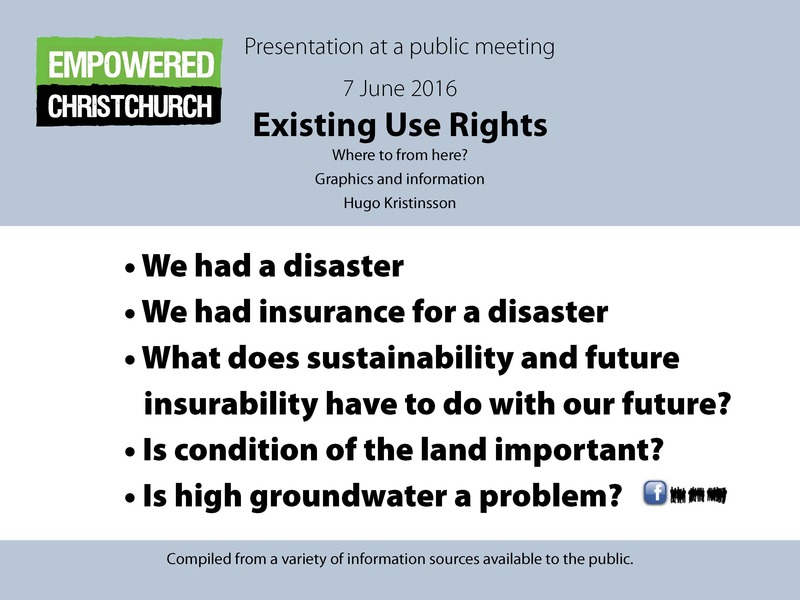 In all of the cases that Empowered Christchurch is aware of, no existing use rights certificate has been issued. 5) MBIE Guidance stating that, if existing use rights were applied, levels had to be at or above the Building Act 2004 level (11.8 m). In the vast majority of EUR cases, Council has wilfully ignored these guidelines and advice, and allowed building at substantially lower levels that benefit insurance companies and leave homeowners with a high risk of flooding. Séamus concluded with a quote from Lianne Dalziel MP, writing to Tony Marriot in 2011, and detailing the risk of leaving residents with homes that were uninsurable against flooding. This underlines the fact that all these risks were already known and were being discussed in 2011, yet the decision was then made to transfer both risks and liability to residents. Adrian Cowie then discussed the relationship between policyholders and their insurer, and between policyholders and the EQC. He pointed out the difference between a homeowner voluntarily requesting the application of existing use rights, where there is personal, individual control, and the way it has been used under insurance policy relationships. He emphasised that Christchurch City Council had no role to play in these relationships, which were governed by the specific insurance policy on the one hand, and by the EQC Act on the other. Under the Building Act, no action is required for a building damaged by an earthquake. However, this is not the case pursuant to the Earthquake Commission Act. When introduced, MBIE guidelines proposed repair standards that were well below what was required under the EQC Act and most insurance contracts. He argued that Council has nothing to do with whether a building needs to be lifted because of settlement from the earthquakes. Adrian had requested Peter Sparrow to withdraw the video mentioned above, where the Council’s General Manager, Consenting and Compliance, had claimed that only five houses were affected. This is because floor levels and building height are crucial factors in every insurance policy claim (as new/as when new). Despite multiple requests for Council to issue a statement that they have no role in setting the standard for insurance policies, it has consistently refused to do so. This, he felt, was quite a shocking approach from an elected City Council. MBIE agreed to publish a statement of this kind on its website, explaining that its guidance does not apply for insurance policies. As regards existing use rights, insurers have been saying “we don’t need to lift your house because we have existing use rights”. They have also used MBIE guidelines as an excuse not to lift, but only to repair foundations. This is incorrect. If a building was not flood-prone when new, and has settled in height and been damaged, it must be restored to a non-flood prone status after the damage has occurred. So Adrian’s advice was to ignore anything from Council and focus on the claimant’s individual entitlement under the insurance policy or pursuant to the EQC Act. The respective standards in each are what is definitive, not what the Council says. At a recent surveyors’ conference here in Christchurch, UN Margareta Wahlström, the head of the United Nations Office for Disaster Risk reduction (UNISDR) singled out urban flooding as the greatest global risk to communities over coming years. This is very relevant to the Christchurch situation, where there has been significant land settlement and areas are now exposed to extreme flood risk. Despite this, CCC, EQC and Council are claiming that everything is fine and that buildings do not need to be lifted. Adrian reminded listeners that many New Zealand insurance policies (before the earthquakes) had no limit to the cost of reinstating buildings (no limit to the sum insured). 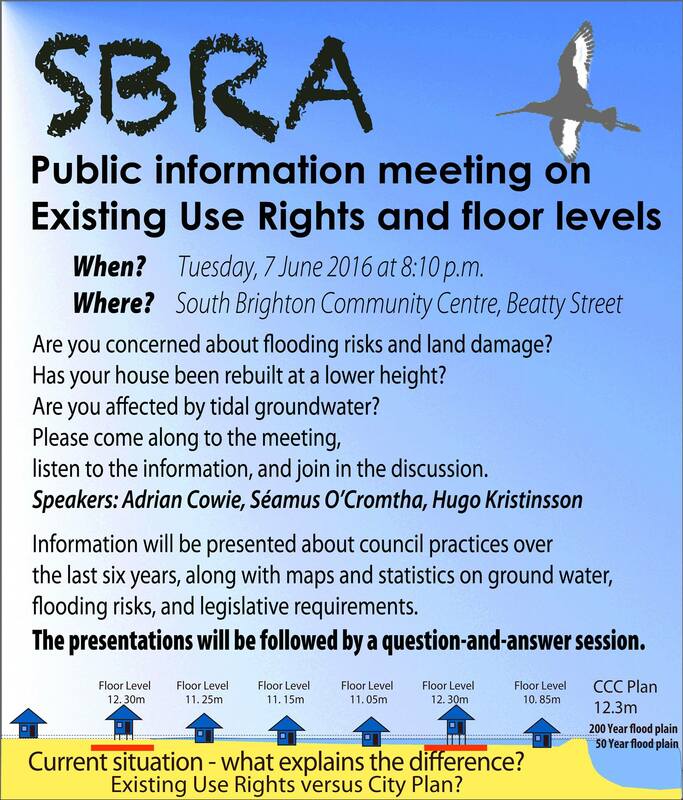 Yet in the South Brighton area, almost no buildings have been raised to the 11.8 m, never mind the 12.3 m floor level. Of the properties in the South Brighton area that have been recently surveyed, and presumably rebuilt, almost every single one now has a hazard notice. This transfers the risk of flooding and erosion from insurers and Council to the homeowner. This is happening in Christchurch, which is ironically a member of the so-called “100 resilient cities” group. Council has also been holding what appear to be secret meetings with insurers and PMOs since the earthquakes. There has been absolutely no evidence of Council actively trying to help ratepayers. From the declaratory judgement, it appears the High Court allowed EQC to use the Diminution of Value in the absence of any evidence to the contrary provided by the owner. So if your land has sunk and you can prove the fact, Adrian argued that EQC was obliged to lift it to at least its pre-earthquake height. In almost every case, the cost of this would be significantly more than the DoV payment. A further complication is that, in the future, if we have another earthquake, EQC cover could be refused because you did not spend an earlier DoV settlement to remediate your land. In conclusion, Adrian recommended obtaining expert advice on land settlement to oblige EQC to restore it to the original height. Similarly with house claims, he advised getting expert advice, expensive though it may be EQC is reimbursing owners their expert fees where these have shown EQC’s assessments to be in error. Under the EQC Act, the standard of repair is extremely high, and in most cases, it has not been met or assessed to the correct standard. Likewise, many private insurance assessments have assessed to the wrong standard, so it generally pays to obtain your own, expert advice. In summary, existing use rights in relation to floor levels and minimum flood heights are irrelevant in terms of an insurance policy. You cannot have existing use rights to rebuild a house lower and in a flood-prone or more flood-prone condition than it was when new, since this contradicts the “as new/as when new” definition in the insurance policy. Council’s rules or exemptions have no role to play in this. In the third presentation, Hugo displayed a series of documents and maps, contrasting the original intentions with the “recovery” and what was actually implemented in practice. 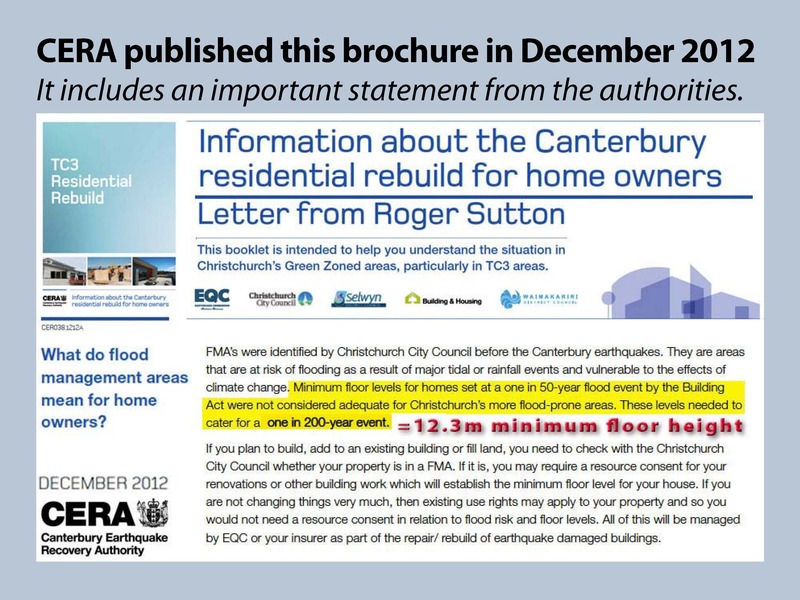 In the first brochure, CERA stated that 11.8 m as a minimum floor height was insufficient in the flood-prone areas in Christchurch and that 12.3 was more appropriate. CERA also stated that it was working with the insurance companies to ensure houses would be raised to the correct level. 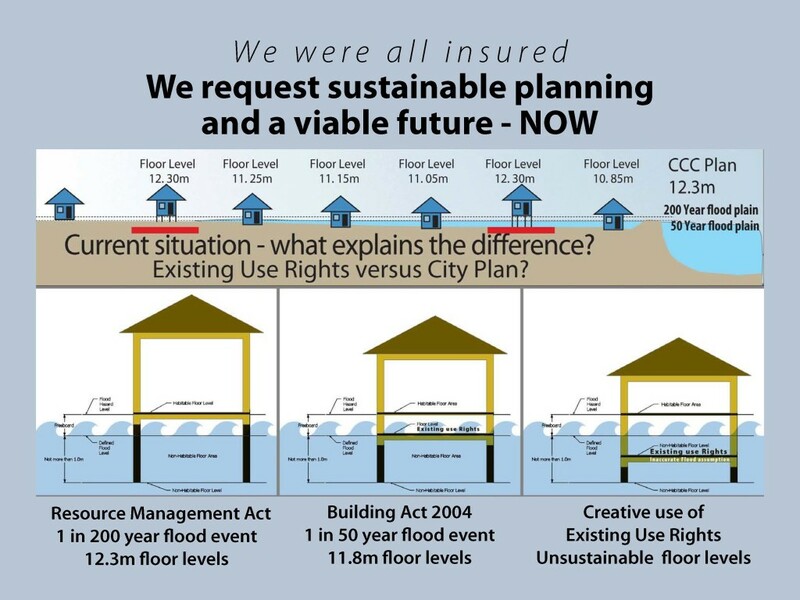 A CCC newsletter stated that existing use rights might apply for a rebuild on exactly the same footprint “so long as this was at or above the Building Act height” (1-in 50-year flood event = 11.8 m). In a tidally influenced area, the higher RMA floor height should apply (12.3 m). A CCC document from October 2012 showed houses before and after the earthquakes, with the new houses having been raised to a safe level. This comforting scenario did not eventuate. He reminded the audience that the current minimum floor heights are 11.8 m under the Building Act, and 12.3 m under the Resource Management Act. Maps were presented showing the area of land with groundwater at less than a metre below the surface. This covered a substantial area (including both red and green zones to the east and west of the lower Avon. Under these conditions, land has started to erode from underneath. 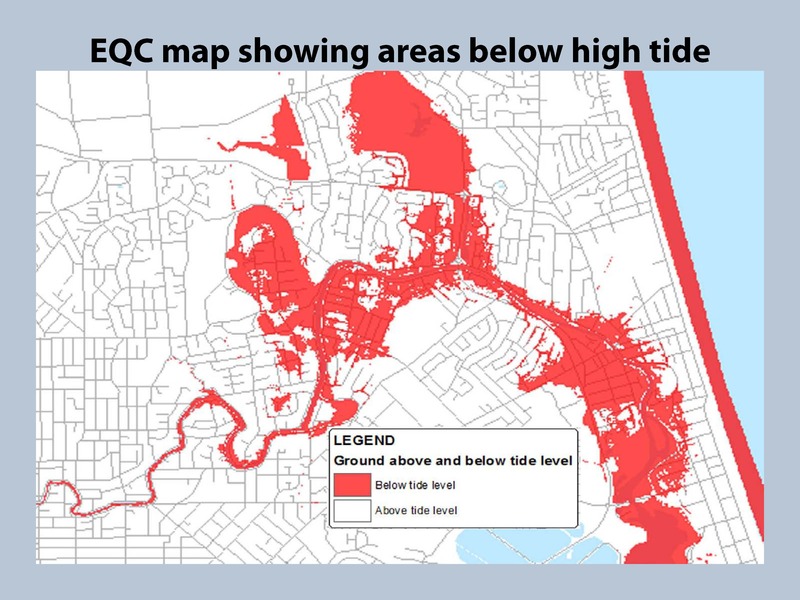 An EQC map highlighted the houses that were below the high tide mark. Hugo had questioned Gerry Brownlee on this subject at the Earthquake Forum back in 2013, but the Minister had then denied that any houses were below the high tide mark and repeated this assertion later on RNZ. 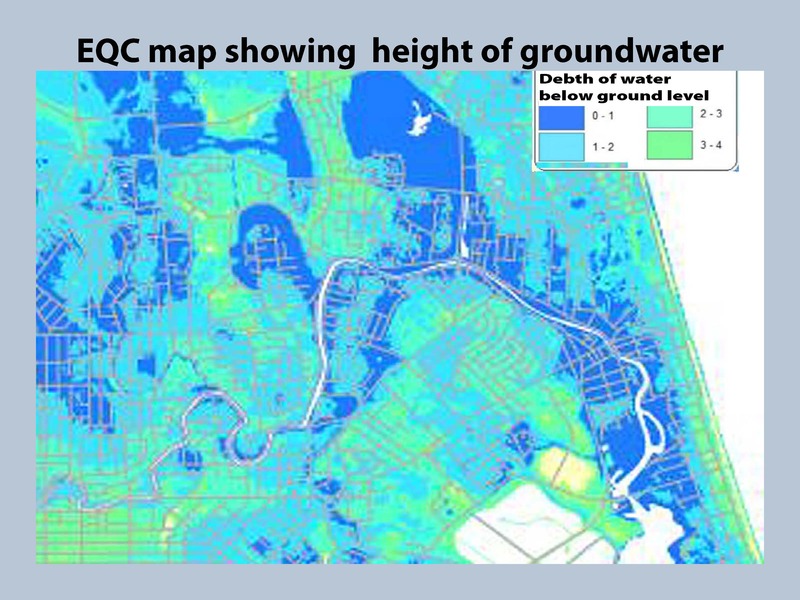 The map shown was published with the IFV documentation from EQC and can be found on the EQC website. 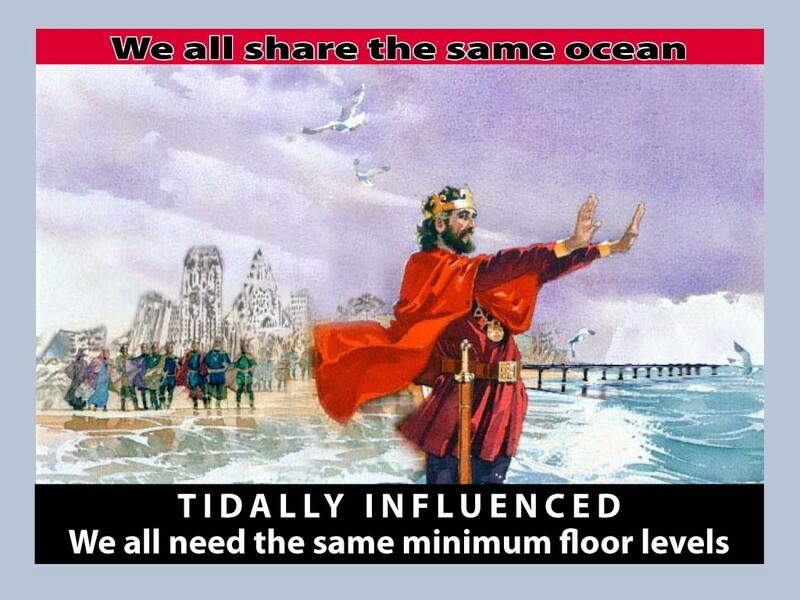 11.2 m is the elevation given for the high tide (10.8 m plus 40 cm freeboard). 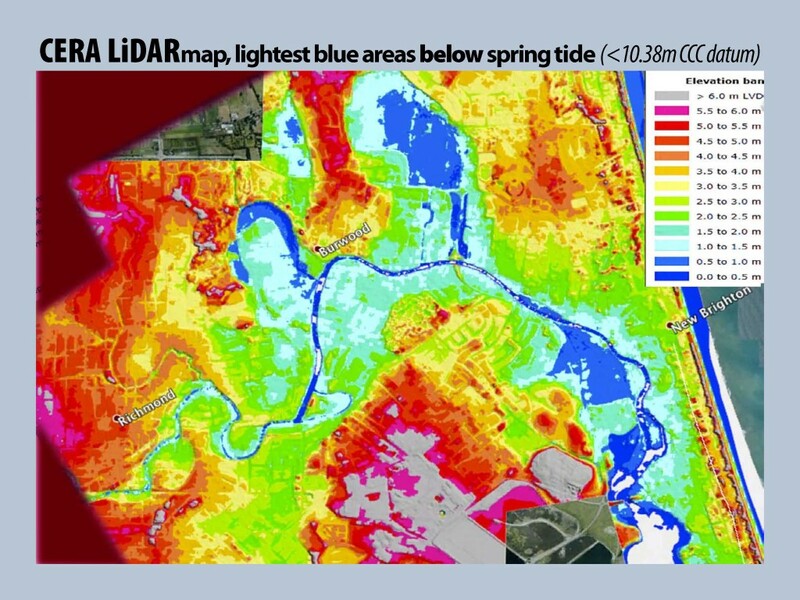 A further LiDAR map showed much the same area for houses situated below the high tide mark. The original map colours had been adjusted to show differences in elevation more clearly. A member of the audience asked for an explanation of the high tide mark. Hugo explained that the term generally used was “mean high water spring”, which is the average level for successive spring tides. A follow-up question asked if the property would flood if it was below that mark. Hugo explained that several different factors came into play, such as groundwater and tidal influence. While some risks were gradual and could be lived with, others were more problematical. 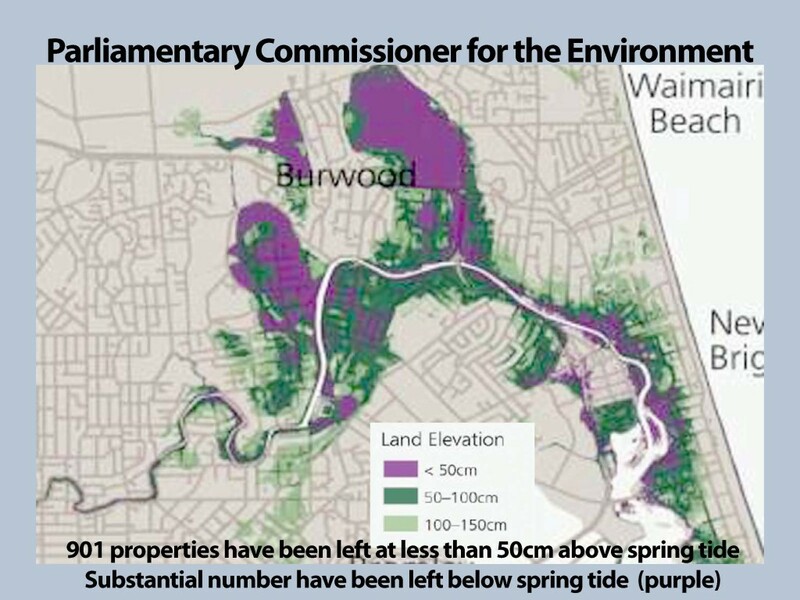 The next map was published by Dr Jan Wright, Parliamentary Commissioner for the Environment. This identified properties at high risk of flooding, the most immediate risk that New Zealand will have to face from climate change. Once again, the same contours in the lower Avon were visible as on the previous maps. 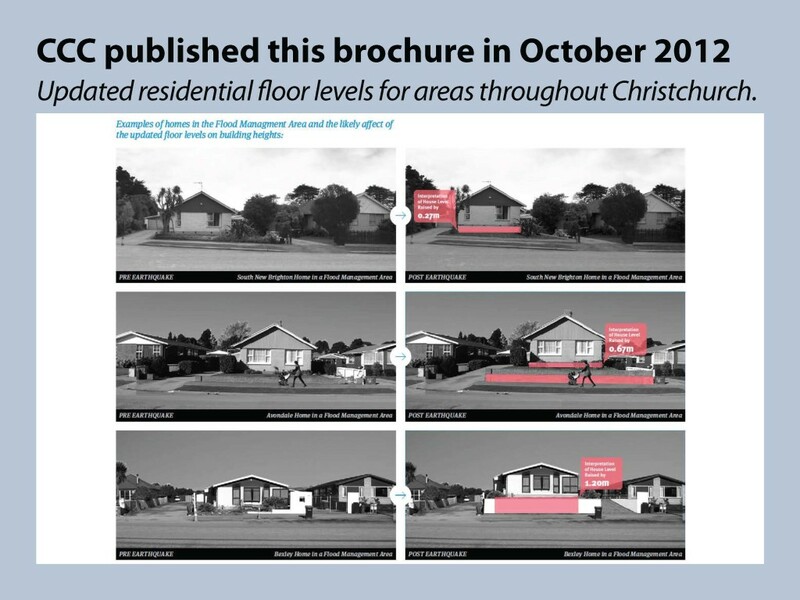 The Commissioner estimated that there were 900 properties in Christchurch at the 11.2 m level or lower, and which were therefore at risk of flooding. Such houses, especially those close to the river, will have a very short lifetime in the face of rising sea levels. A recent Council map identified the red zone area, and also the low-lying green zones, some of which have also extremely high groundwater. This map also defined the tidally influenced area, yet the City Council has asserted that only an area as far as Admiral’s Way in New Brighton, but not beyond, is tidally influenced. 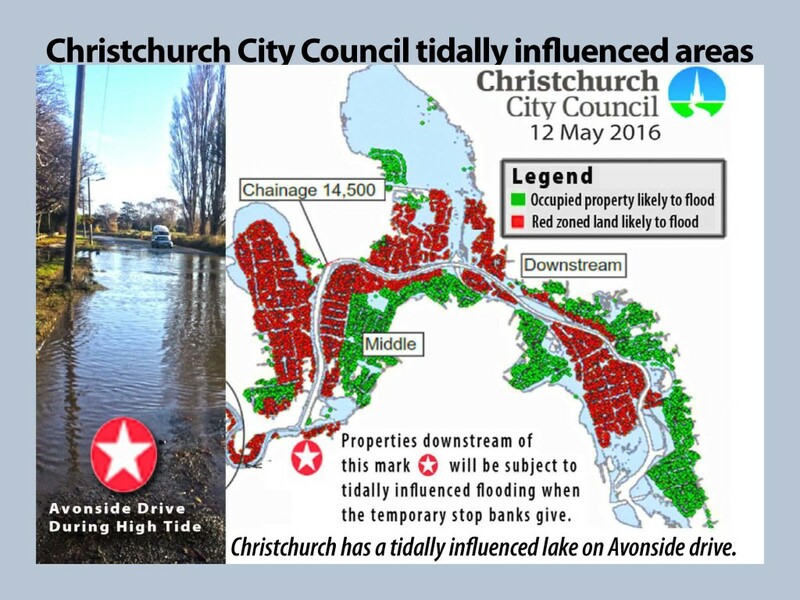 This is patently incorrect, since a lake appears much further into the City on Avonside Drive at high tide and disappears at low tide. This demonstrates that the tidally influenced area extends much further upriver. Even six years after the earthquakes, Council has made no plans for this fact. The latest information suggests that this situation may drag on until 2021. Most of Christchurch is tidally influenced, and not only the coastal area. Given that a large part of the city has sunk, the incoming and outgoing tide is also removing a large quantity of land each day. The next maps, a set of three, showed groundwater boreholes at 20 m, 70 m and 100+ m from the river. The closer to the river, the greater the fluctuation in groundwater between low and high tide. In the light of rising sea levels, groundwater will eventually come to the surface, and sooner rather than later in the areas closer to the river. 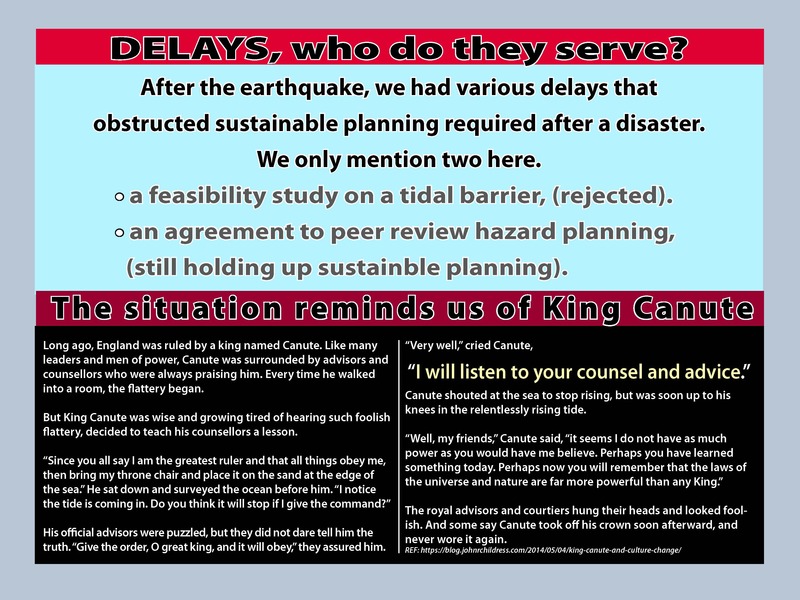 One way to address this problem, as recommended in the coastal policy statement, is to build relocatable houses, plan to remain for a short period, and then move elsewhere. 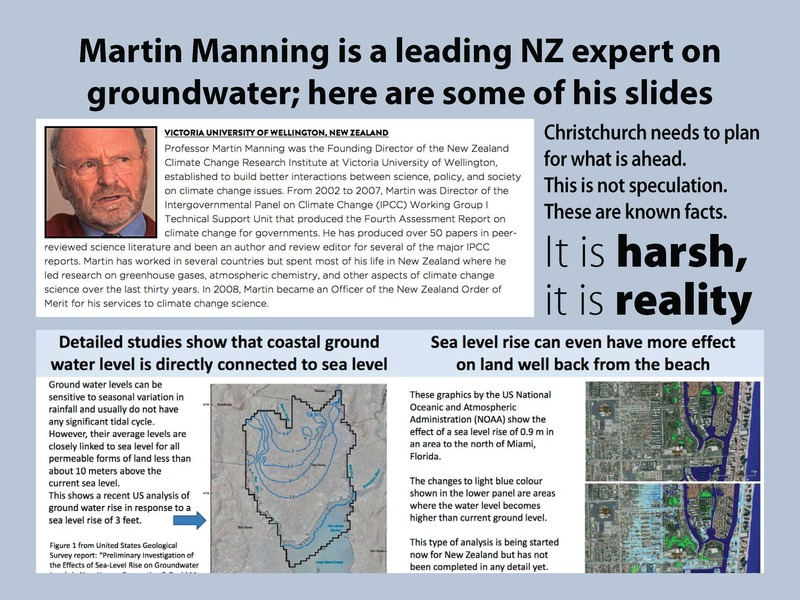 The next slide was a statement from Martin Manning, an expert on groundwater and climate change. Studies show that coastal groundwater is directly connected with sea level rise. In Florida, groundwater has now reached the surface in some low-lying areas. A rise in the water table, which we have had here because of the loss of land height, automatically increases the flood risk. According to Civil Defence, the risk of flooding is currently much higher than the risk of earthquakes. With such high groundwater, there is no additional storage available in an extreme weather event. A further point was that, bizarrely, EQC’s flood modelling for increased flooding vulnerability (IFV) uses a bathtub model, which makes no allowance for storm surge (freeboard) and has no margin for error. 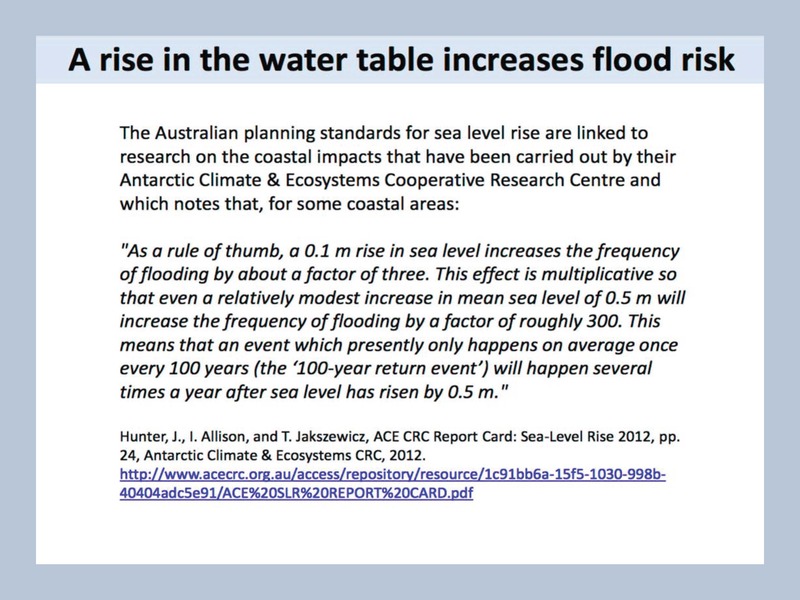 Hugo reminded listeners of the massive erosion that followed last week’s storm in Australia as an illustration of how foolish such an approach is. Can we plan for a change? Will the poor inherit the shore? Closed groups of authorities have been planning for our future, without any involvement of the communities and without any dialogue process. The natural hazards chapter in the Replacement District Plan was removed in September 2015. According to the latest information, Hugo believed that some of the authority of the Independent Hearings Panel for the Replacement District Plan would be transferred to Christchurch City Council to pass using the Resource Management Act. There has been no information about what changes are planned or when they will take place. Six years after the natural disaster, there is absolutely no excuse for further delay. So the new hazard notices on properties basically constitute a removal of assets. Hugo called on the audience to make a careful and educated decision when deciding on their future. The final slide was sent to CCC by Hugo in 2012. It pointed out that inaccurate flood modelling and EUR have created this situation where housing is being made uninsurable. A Q&A session then followed. 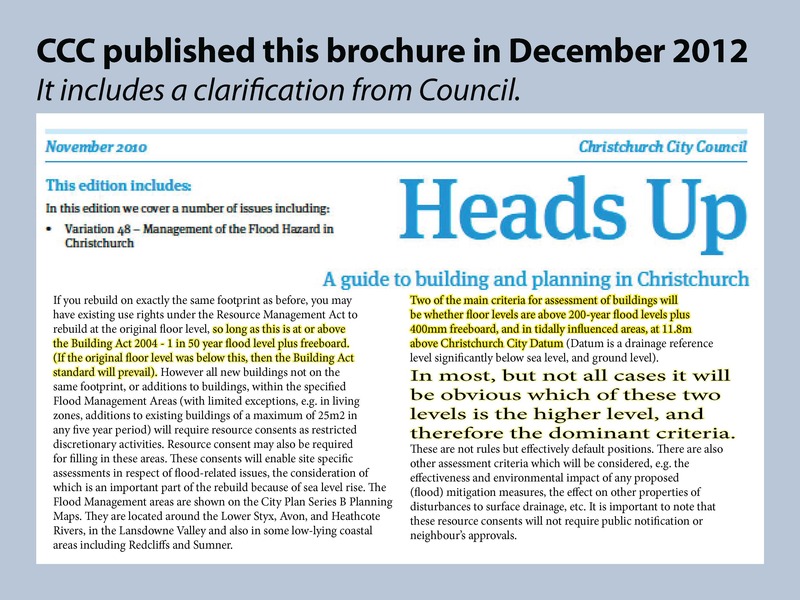 A question was asked about the Empowered Christchurch template letter to Council, stating that the homeowner would not accept existing use rights requested by a third party. Hugo said that while this had been effective, promotion of the declaration on the part of Council would have been more welcome. The representatives from Council were asked if this could be done. Councillor David East stated that he was Chair of the Regulation and Consents Committee at Council, but that “we don’t get involved in the day-to-day work of building consents”. He also said that he was not aware of any houses that had been built below the 11.8 Building Act level. He added shortly afterwards that, according to the information he had been given, not more than 5 houses had been built below the correct level. The discussion continued for some time, but with little new information coming from the Council representatives. Two additional slides were added to the presentation following the event, before the presentation was forwarded to elected members of Council. Here it is confirmed by Mike Stannard from MBIE that surface structures do not work in the Eastern suburbs where there is 30-40 m down to gravel. High groundwater and liquefaction down to 20m or more.